Juan Williams; and Arianna Huffington, co-founder and editor-in-chief of The Huffington Post. ATLANTA -- In celebration of the 25th anniversary of Martin Luther King Day, thousands of Americans paid tribute to Dr. Martin Luther King, Jr. by not only volunteering their time, but engaging in service related dialogue. HandsOn Network, the volunteer arm of Points of Light Institute and the largest volunteer organization in the nation, engaged communities across the country to discuss the impact Dr. King held on the service industry. On Sunday, January 16, HandsOn Network joined with national civic leaders to host the first America's Sunday Supper in Washington, DC. Sponsored by Kraft Foods, the supper featured panelists Arianna Huffington, co-founder and editor-in-chief of The Huffington Post; Legendary Olympian and UN Ambassador Carl Lewis; Barton Seaver, Esquire Chef of the Year 2009 and National Geographic Fellow; NBA Legend and NBA Global Ambassador Dikembe Mutombo; S. Leo Chiang, Producer/Director of "A Village Called Versailles"; Michelle Nunn, CEO of Points of Light Institute; and Robert Egger, Founder and President of the DC Central Kitchen. The Supper was moderated by Fox News National Political Correspondent and author Juan Williams. 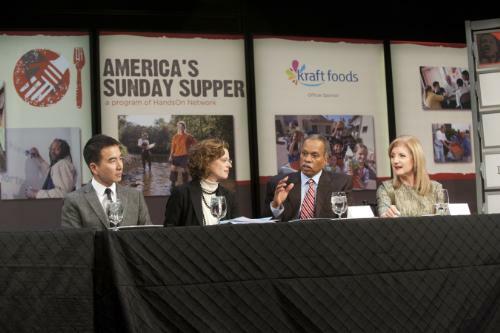 "America's Sunday Supper was an opportunity to engage our nation in a constructive dialogue about Dr. King's legacy of service and bring Americans back to the table," said Michelle Nunn, CEO of Points of Light Institute and Co-Founder of HandsOn Network. "Our hope is this conversation sparked similar discussions at tables across the country and will continue as Americans host their own local Sunday Suppers, inspiring and mobilizing a new generation of change agents." The event was broadcast here on Black Radio Network and through www.HandsOnNetwork.org to millions of homes across the world. Thousands of viewers watched America's Sunday Supper with more than 3,000 streams and 1,200 unique viewers in ten countries. Participants across the nation joined America's Sunday Supper through live chats and were able to post pictures and videos and share their service experiences about how the service movement has impacted them and their communities. Panel discussions included the importance of Dr. King's legacy, the call to service, America's next generation of service leaders, and activities happening throughout the country. Concurrent to America's Sunday Supper in Washington, community and civic leaders participated in an estimated 150 local Sunday Suppers across 33 states. An estimated 1,200 individuals participated in suppers in their homes, local restaurants and other sites, where they came together to discuss important issues in their local communities. Martin Luther King, Jr. Day of Service marks the beginning of a year of service and a drive to create new innovations to combat tough national challenges. These events and dialogues are created through public private partnerships and are supported by Kraft Foods, NBA Cares, American Express and U.S. Bank. There are multiple ways people can serve, celebrate and engage in the various projects across the U.S.
HandsOn Network, the volunteer-focused arm of Points of Light Institute, is the largest volunteer network in the nation and includes 250 HandsOn Action Centers in 16 countries. HandsOn includes a powerful network of more than 70,000 corporate, faith and nonprofit organizations that are answering the call to serve and creating meaningful change in their communities. Annually, the network delivers approximately 30 million hours of volunteer service valued at $626 million. NBA Cares is the league's social responsibility initiative that builds on the NBA's long tradition of addressing important social issues in the United States and around the world. Through this umbrella program, the NBA, its teams and players have donated than $145 million to charity, completed more than 1.4 million hours of hands-on community service, and created more than 525 places where kids and families can live, learn, or play, in 22 countries on five continents. NBA Cares works with internationally recognized youth-serving programs that support education, youth and family development, and health-related causes, including: KaBOOM!, Special Olympics, Boys and Girls Clubs of America, UNICEF, the Make-A-Wish Foundation, and the Global Business Coalition on HIV/AIDS, Malaria and Tuberculosis.